A few weeks Ana Luisa Cid advised us of the chase involving several police units in the city of Mexicali, Baja California. She has posted a video of a segment of the La Sobremesa program (dated 26 Jan 2012)in which she interviews journalist Juan Galván of the La Voz de la Frontera newspaper. Click here or on video above to watch the La Sobremesa segment. 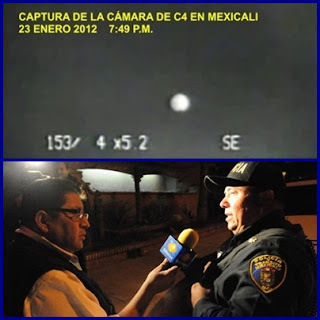 Prof. Cid has sent us two photos - one is from the C4 camera system depicting the object that was seen over the airport; the other shows journalist Galván interviewing Officer Ruelas.